Seraphin Enrico's Jardin de l'Eden, an art environment with a variety of colourful sculptures from concrete, doesn't exist any more. 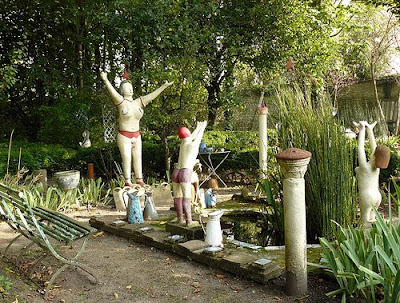 Just some sculptures have been saved, like a group of bathers around a small pond, currently exposed in the Musée-jardin de la Luna Rossa in Caen. 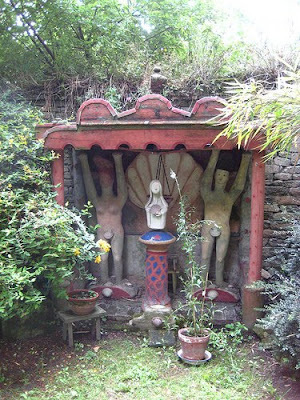 Olivier Thiébaut, who in the 1990's was behind the initiative to start this private museum, is also closely related to the unearthening of some of Enrico's dumped sculptures. The story has been told by Thiébaut himself on Bruno Montpied's weblog (march 23, 2008, text in french). What follows is a resume. Séraphin Enrico (1898-1989) was born in Mougrando, Italy. After the first World War he left for France to find a job as a mason. From 1925 on he had a house in the community of St Calais, in the Sarthe area, east of the city of le Mans. 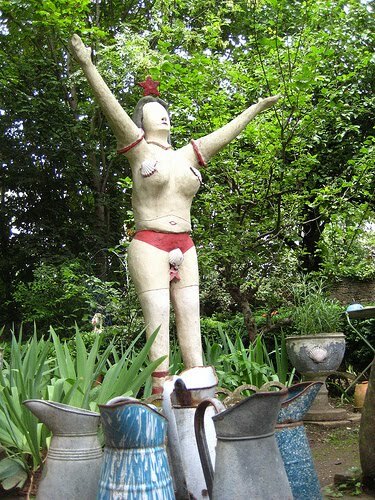 In 1959, when he was in his early sixties, he began making sculptures as a decoration of his house and garden, a creative activity he continued for over ten years. The site became a popular place to visit and in the 1960's and 70's it attracted a lot of people. picture from magazine "Vie Mancelle et Sarthoise"
However, when Enrico became older he had to leave St Calais for reasons not listed in the available documentation, but probably against his will. He joined other members of his family, who lived in Divonne-les-Bains. That was in 1972. Enrico died in 1989 and it is presumed that he has never been in St Calais again.. Soon after he left, the site must have been demolished, although it is not quite clear to me how and by whom. Anyhow, in 1995 Thiébaut. who was very interested in outsider environments in western France and who was preparing a book about the subject, got the idea to ask permission to do some digging on a plot, an old pond, where as some inhabitants of St Calais said, items of the garden might have been dumped. And bingo, Thiébaut and the friends who helped him, discovered a number of buried sculptures, most still with the lively colours Enrico had used to paint them. Moreover, Enrico had constructed his sculptures so robustly, that they emerged out of the dump in their entirety. The rescued sculptures currently are out in the open again, facing the skies, displayed in the garden of the Musée de la Luna Rossa in Caen. Like a real work of archaelogy. What a look that somebody take the job to look after those great sculture pieces and a luck that they successfully managed to find them. And it makes me think if it could be possible that several many others art works like that may be now lying under the earth, without we having any news about their existance. Hope at least that some curious archaelogist or researcher from nowadays or from the future, got to bump with them once. 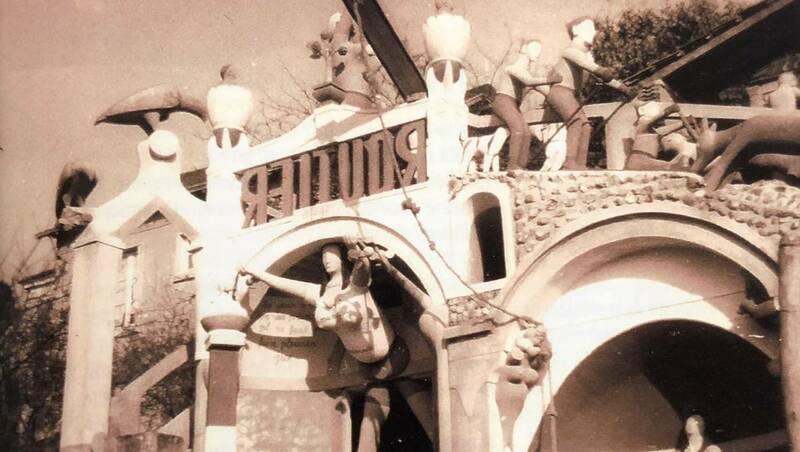 The wonderful thing is that Seraphin's work are protected in the Jardin de la Luna Rossa, in Caen, Calvados(14). At the very start was, there was Olivier Thiébaut, an artist passionate about Outsider Art/ Art Brut. The land was formerly owned by a lady resident of the street, right next to the garden; she left it to the town with the agreement it will remain a garden. When the Association started looking for some land for the Luna Rossa Garden, the town proposed this property which it still owns. The garden was abandoned for 25 years, so there was a lot to do to get it back in shape. Olivier Thiebaud was interested in the Outsiders. He traveled across France, discovered artists who had never been recognized for what they were: Artists!. 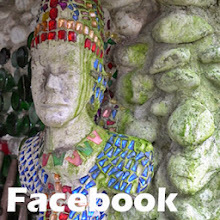 The Art works at the garden come from donations or loans. About forty works by ten different artists installed in the garden of about 950 m2. From the Sarthe to the Orne via Calvados, the works of the garden of Luna Rossa are in the image of the artists who shaped them: a mosaic of influences and representations. The garden's name comes from a work exhibited there; "Luna Rossa", is inspired by a statue of Seraphin Enrico, on whose buttocks this mention. The garden is maintained by a team of voluntars who do some repairs, painting, cleaning.